Most of the questions you have can be answered on your online profile. Log in to My Profile which can be found at the top of our home page at s-trip.com by using your email address and password. My Profile - Here you will see the progress bar that will show you what information we still need from you before you are ready to travel. If the bar is at 100%, congratulations! Your profile is complete and we don't need any other information from you. If you are not at 100%, you'll see notifications below to show what information is still missing. 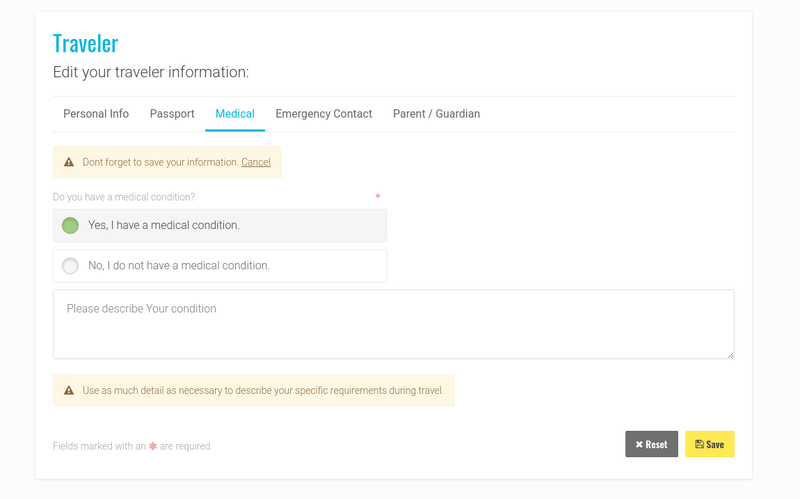 Traveler - Here you can update all of the traveler's information including Personal Details, Passport, Medical Conditions, Emergency Contact, and Parent/Guardian Information. Settings - You can update your password, email preferences, and your user photo in this section. Payment Methods - You can update your payment method, review the payment history, or make a payment. On the left hand side under My Trips, you will find a list of the trips you have booked with I Love Travel. 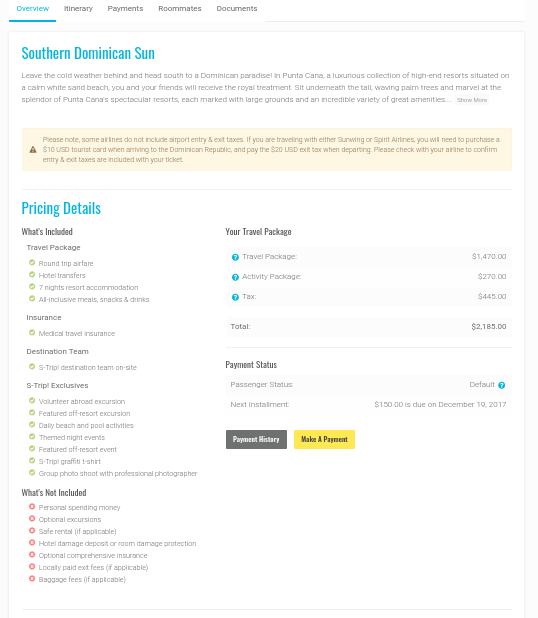 Each trip will show a breakdown of the Overview, Itinerary, Payment, Rooming, & Documents as explained below. If you are an organizer, you will also find your Organizer Toolkit under this section. Overview - Here you will find what is and isn't included with your trip, who the S-Trip! Trip Planner for your group is, and the names and the contact information for the Student Organizers who attend your school. You will also find contact information for our Help Desk in the event that you have any questions for us! 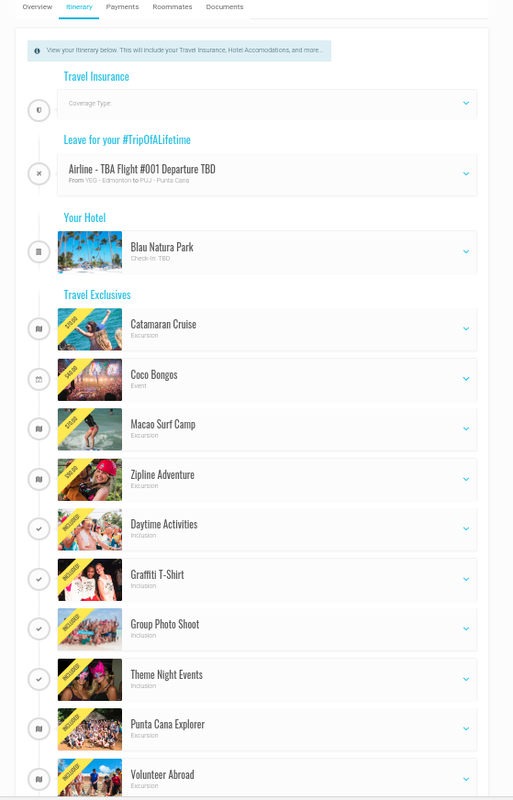 Itinerary - In this section you will find a breakdown of the Insurance, your Travel Itinerary with your flight details, information about your Hotel, and details on what excursions and events are included or are available for purchase. Here you can read a quick excerpt about each activity or event as well as purchase any extras. 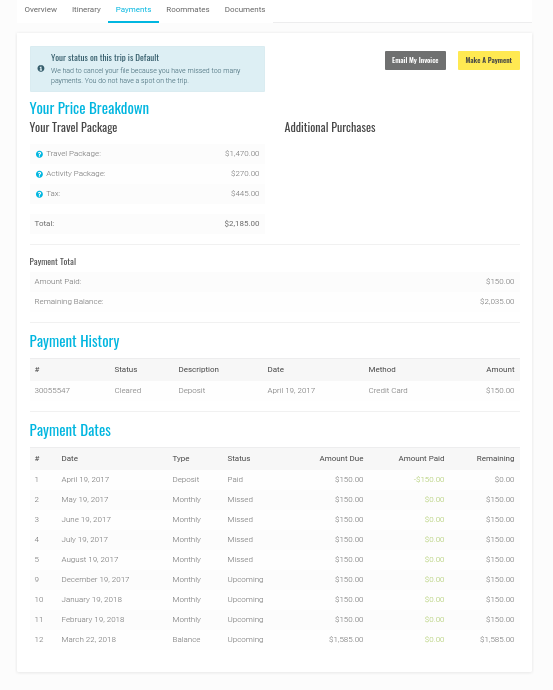 Payments - The payments tab has Your Price Breakdown, the Payment History, and the Payment Dates. Your Price Breakdown will show the cost of your travel package, the activity package, and the taxes, as well as any additional purchases you have added to your trip. It will also show the amount you have paid as well as your remaining balance. The Payment History will show all of your transaction attempts. If the status is Cleared, that means the payment was received in our system. If the status is Not Received, that means the transaction was declined, and we did not receive those funds. Payment Dates will show your payment schedule for the trip and your final balance date. Rooming - Here you may review your room type, room occupancy, and room number. This room number is not your actual hotel room number as you won't get your actual hotel number until you check in. Under Roommates, you will be able to submit a rooming request. 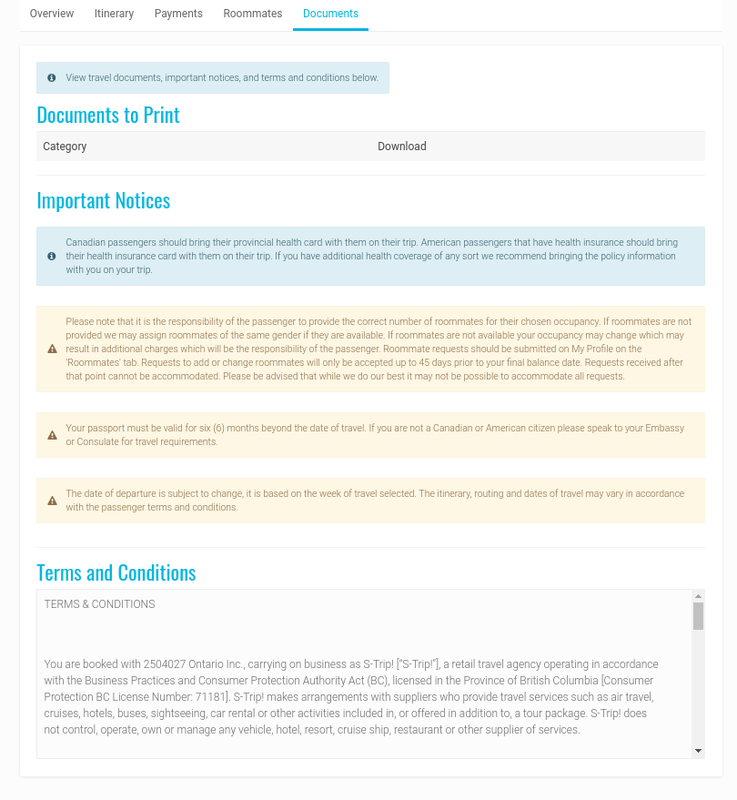 Documents - Anything you will need to print out for your trip will be found here. This is where you will find the S-Trip! Code that all passengers (and their parents if under 18) must sign in order to travel with us. Closer to the trip you will also find your insurance card, program calendar, and your e-ticket in this section. You should also review the Important Notices and the Terms & Conditions for your trip here.